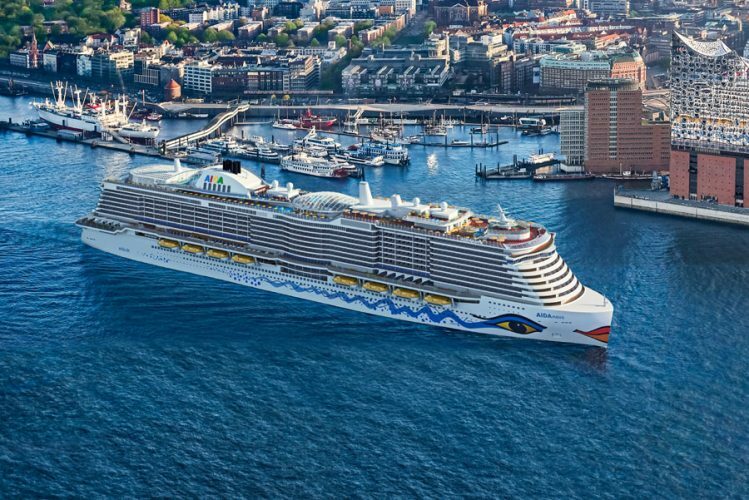 The largest ever Carnival-owned cruise ship operated by Adia Cruises will soon depart the Meyer Werft shipyard in Papenburg, Germany. Aidanova will soon sail to the Netherlands for the final stages of outfitting before debuting in December from Hamburg. Aidanova is the first of a new generation class of Liquified Natural Gas (LNG) powered cruise ships. 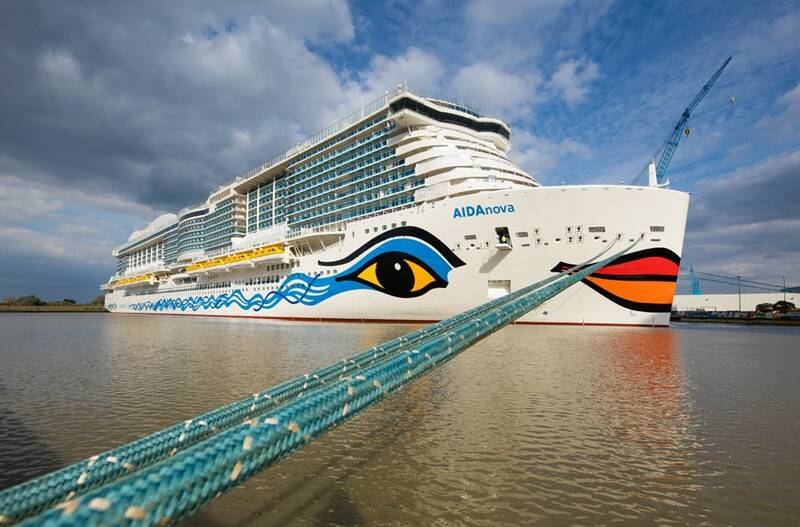 German-based Adia Cruises will operate the ship which in turn is owned by the Carnival Corporation. In fact, Carnival Cruise Line will get their own version of the ship in 2020. Aidanova will be leaving the Meyer Werdt shipyard for the very first time on October 8. The large ship will be transferred to Eemshaven (Netherlands) with an arrival on the morning of October 9. This is no easy task as the huge new class ship will have to make her way through the Ems river with the assistance of tugs. Just like cruise ships before her, it is a long and precise process. You can see the Ems River conveyance which Norwegian Joy did back in 2017. On Monday at around 07:00 am, it is time to “cast off”. At 8:00 am, AIDAnova passes the dock gate in Papenburg. At about 2:30 pm, AIDAnova passes the Friesen-bridge near Weener followed by the Jann-Berghaus-bridge in Leer at around 7:00 pm. After the passage of the Ems barrier Gandersum around 1:00 am, the ship is expected to arrive in Emden at 02:30 am and moor in Eemshaven at 09:00 am. It’s a major event for locals and cruise enthusiasts with the cruise line providing food stalls at certain locations along the journey. It provides a great way of capturing some amazing photos and as a new class ship, it’s even more special. As usual, when it comes to a cruise ship conveyance along the Ems River weather conditions play a major factor. The ship’s departure could be delayed with times shifted. This all depends on wind and water levels on the day. Coming up next for Aidanova will be the gradual arrival of all the 1,400 crew members starting from mid-November. They will begin to set up their departments and get the ship ready for the first guests. The ship has already had a christening ceremony held at the shipyard in August. From Eemshaven the ship will head to Bremerhaven, Germany where she will finally be delivered from Meyer Werft to the cruise line. Aidanova will begin sailing 7-day cruises to the Canary Islands and Madeira from Hamburg in mid-December. The ship is a huge 180,000 gross tons with 2,600 passenger cabins. The largest ever Carnival-owned cruise ship for the German market is scheduled to float out as a whole for the very first time at the Meyer Werft shipyard in Papenburg, Germany.